Choosing the right outdoor wireless vendor is critical for the success of a wireless backhaul project, whether it’s a licensed microwave link, unlicensed wireless Ethernet bridge, wireless mesh, WiMax, point to point wireless backhaul, or point to multipoint wireless Ethernet bridges. Not all wireless vendors or wireless installation companies are the same. Too many companies and people claim to be RF Engineers or outdoor wireless backhaul experts without ever having any real world project experience. Some wireless vendors are just “box movers” with a sole purpose to sell hardware. These companies typically do not have any field experience with wireless installations, wireless site surveys, or spectrum analysis. They may be able to do wireless path calculations using some software programs, but the information they use for the outdoor wireless network design is based on information they receive from the client. Because they lack any real world filed experience they tend to miss the fine intricacies that can make or break an outdoor wireless backhaul project. They also typically try and push to the customer whatever product makes them the best margins. Some “so called” wireless vendors come with the IT networking background. They too lack any real world outdoor RF or microwave experience. They may focus on a conceptual wireless network design but have no understanding on the details of what it takes to actually install and maintain an outdoor radio system. Everything looks great on paper but when it comes time to install the system and make it work everything goes south when there is a huge groove of trees or buildings in the way! These companies might be good at the network integration portion of a project but have no clue to the way outdoor wireless systems perform in the field or what it takes to properly do a wireless installation. There are some great outdoor wireless vendors that have a ton of outdoor radio system experience but lack any knowledge of integrating the wireless infrastructure to the client’s network. A true outdoor wireless integrator will have in house experience with all aspects of an outdoor wireless backhaul system. A good wireless integrator will know how to properly design a wireless backhaul network, perform accurate wireless path calculations, and understand exactly what it takes to deploy a wireless backhaul network. The good companies have experience with point to point unlicensed wireless Ethernet bridges, licensed microwave links, wireless mesh, point to multipoint wireless bridges, etc. These companies know the industry and can make appropriate recommendations on whether unlicensed wireless Ethernet bridges or licensed microwave links are right for the backhaul solutions or which is the right fit between wireless mesh and point to multipoint wireless bridges. Good wireless vendors also understand IP networking and can integrate the outdoor wireless system into the client’s network. The good outdoor wireless integrators have experience working with towers, poles, and on roof tops. They know exactly what the mounting and power solutions need to be and what goes into the proper wireless installation of the radio equipment. True wireless integrators can properly plan, price, and insure success of an outdoor wireless backhaul project. What about after the project? Many “so called” wireless vendors come across knowledgeable about designing a radio communication system or claim that have a lot of wireless installation experience. The question to ask is if something goes wrong or there is an issue down the road, will the wireless vendor be there for support. Did the wireless vendor rely on subcontractors for the project? Will they need to coordinate with subcontractors to support the client’s system? What will they charge to perform support if they do need to rely on a sub? These are important questions. The “so called” wireless vendors can’t control if their subs will be around in the future or what they may charge. What about the amount of time it would take to get different companies involved and dispatched? A good wireless integrator performs all the work themselves and does not rely on subcontractors. 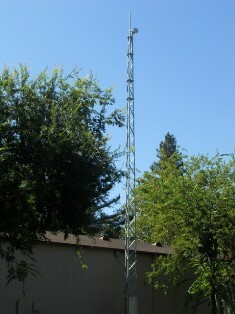 They can take full ownership of the outdoor wireless system and can support it. Wireless backhaul, whether you are talking about wireless mesh, WiMax, point to multipoint wireless, or point to point wireless backhaul, systems can function with extreme reliability and predictability with proper wireless network design, wireless engineering, and a quality wireless installation. The mobile wireless carriers take this matter critically and waste no expenses on ensuring their systems are installed properly. Any down time can cost them tens of thousands of dollars. The craziest thing is when organizations are willing to rely on wireless technology for their primary connectivity but pinch pennies by choosing the cheapest and many times least experienced wireless vendor or wireless installation companies for their projects. The term "Microwave" is a broad term that covers the UHF (Ultra High Frequency with frequencies between 300MHz and 3GHz) to the EHF (Extremely High Frequency with frequencies between 30GHz to 300GHz). 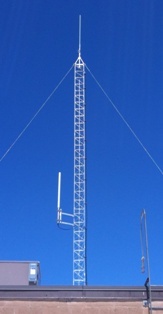 Licensed microwave links and unlicensed wireless Ethernet bridges typically operate in the SHF (Super High Frequency with frequencies between 3GHz to 30GHz) and the EHF bands. A general rule of thumb is that lower the frequency the farther the signal will travel. Also lower frequencies the lower the throughput and higher the frequency the higher the throughput. Again this is in general terms and depends on the wireless radio hardware used. 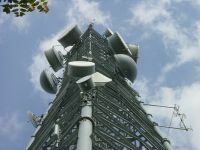 The terms "unlicensed wireless bridge" and "licensed microwave link" refer to the radio frequency spectrum characteristics set by the U.S. Federal Communications Commission ("FCC") or equivalent national government regulatory body. Licensed products require regulatory approval before deployment while license-exempt products can be deployed without any regulatory approval. Licensed microwave link frequencies used for wireless backhaul in a point to point wireless backhaul operate 6GHz, 11GHz, 18GHz, 23GHz bands and the 80GHz millimeter wave E-band. Unlicensed wireless Ethernet bridges, used in point to point wireless bridges, point to multipoint wireless bridges, or wireless mesh configurations, typically operate in 900MHz, 2.4GHz, 5.3GHz, 5.4GHz, or 5.8GHz frequencies. 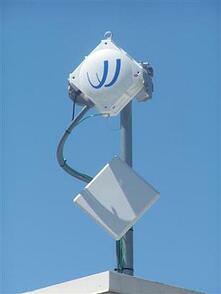 There is also the 60GHz millimeter wave band that is used for point to point gigabit wireless bridges. There are registered frequencies that many think are licensed but are actually unlicensed, like the 3.65GHz WiMax band used for point to multipoint wireless backhaul and the 4.9GHz Public Safety band. These registered bands do provide some protection against interference but only require local users to coordinate with one another on frequency channel coordination. This is often confused by Public Safety organizations that think the 4.9GHz band is for exclusive use by local law enforcement. Anyone can register the use of the 4.9GHz band as long as it's used for some form of public safety, such as video backhaul. Licensed microwave wireless radio systems are typically built and designed for long term solutions. Point to point licensed microwave links are true fiber replacement systems and offer full duplex wireless communications for both Ethernet and TDM. The licensed wireless bridge hardware is designed to provide carrier grade performance (high bandwidth and low latency). Because a microwave link is licensed and is not to inject and interference on other licensed microwave backhaul operators in the area they must have LOS (line of sight) and not cause heavy multipath. This is a common question of why licensed microwave radios don't use OFDM or MIMO and why they can't be used in NLOS (non line of sight) applications. In a NLOS wireless link application unlicensed wireless backhaul radios that use OFDM or MIMO take advantage of multipath for their connectivity. 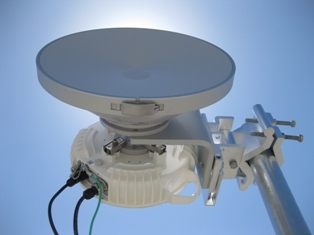 Microwave communication using unlicensed wireless Ethernet bridge systems have been an extremely popular choice for outdoor wireless backhaul. 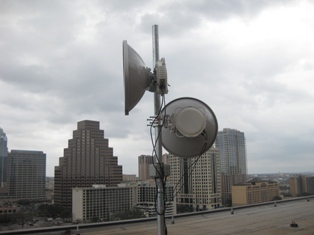 The unlicensed spectrum of 5GHz (5.3GHz, 5.4GHz, and 5.8GHz UNII bands) became a primary selection by many end users and outdoor wireless installation VAR's, because of their flexibility, cost effectiveness, rapid ROI, and quick deployments. Many outdoor wireless manufactures started introducing "value line" point to point wireless Ethernet bridges using 802.11 chipsets. Basically, the same radio boards found in Wi-Fi access points put into an outdoor enclosure and using outdoor wireless antennas. The new 802.11n based wireless backhaul radios use OFDM and MIMO taking advantage of multipath, especially helpful in NLOS (non line of sight) applications. The major issue with unlicensed wireless Ethernet bridges is potential wireless interference. Point to point wireless backhaul can be either a licensed microwave link or an unlicensed wireless Ethernet bridge. The terms "unlicensed wireless" (also called "license exempt) and "licensed microwave" refer to the radio frequency spectrum characteristics set by the FCC or equivalent national government regulatory body. Licensed microwave communication products require regulatory approval before a wireless installation can take place while unlicensed wireless Ethernet bridges can be deployed without any regulatory approval. Most common unlicensed wireless bridges operate in the 900MHz, 2.4GHz, 5.3GHz, 5.4GHz, and 5.8GHz frequency bands. Unlicensed wireless backhaul is susceptible to wireless interference. See article "Wireless Interference - The Effect on Unlicensed Wireless Backhaul." There is also millimeter wave 60GHz band used for gigabit wireless backhaul that is unlicensed. Licensed microwave links typically operate in 6GHz, 11GHz, 18GHz, and 23GHz. 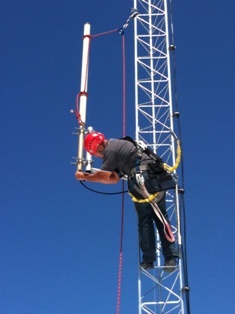 See article "Licensed Microwave Wireless Backhaul." There are a few bands like 4.9GHz public safety band and the 80GHz E-Band that are registered with the FCC but are not truly licensed. Then there is a part of the spectrum that is mostly overlooked and forgotten about. 24GHz is an unlicensed frequency that can be used for microwave communication for point to point wireless backhaul. For a wireless Ethernet bridge, 24GHz offers some great advantages. Because of the ERIP 24GHz is identical to 23GHz band and can be used for shorter range wireless links (typically under 2 miles) but it has tremendous advantages. First it's rarely used so there is virtually little to no wireless interference. Manufactures that make 24GHz microwave communication radios are those that manufacture 23GHz licensed microwave links and use the same carrier grade microwave radio platform adjusted to operate at 24GHz. As a microwave backhaul link systems can do up to 366Mbps full duplex using 256QAM at 56MHz wide channels. That's 720Mbps aggregate throughput! Like licensed microwave links, a point to point wireless Ethernet bridge in the 24GHz unlicensed wireless band provides carrier grade wireless backhaul. 24GHz wireless backhaul is ideal for point to point wireless bridges in areas where there is a lot of wireless interference. The unlicensed wireless 5.8GHz band is becoming heavily saturated and it's becoming difficult to deploy wireless Ethernet bridges in many areas. Because the 24GHz band is unlicensed a wireless installation of a 24GHz point to point wireless link can be deployed in a day without the need to wait for a FCC license. There are many applications that need 100Mbps full duplex connectivity or greater. Millimeter wave 60GHz gigabit wireless radios are also great for shorter applications, but not ever client needs gigabit wireless connections. Most 24GHz microwave communication links can be installed as a 100Mbps full duplex wireless backhaul and can be software upgrade up to 360Mbps full duplex (720Mbps aggregate throughput) protecting the CAPEX investment. If you need a point to point wireless backhaul that can provide 99.999% reliability, need full duplex connectivity, and are worried about wireless interference then take a look at 24GHz!